In just 2 days, the AMGEN Bike Tour will race down the California Coast from Sacramento to Pasadena. 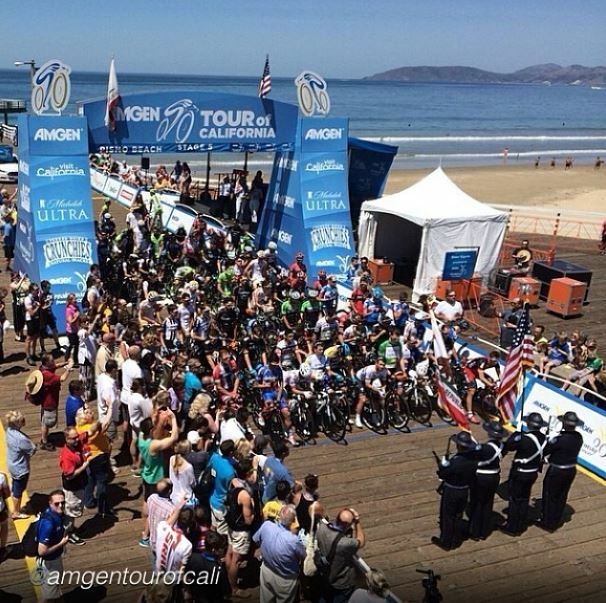 As the 8-stage race makes it way down the coast, both cyclists and spectators can visit the Pacifica Hotels’ booth in Pismo Beach from 10 am – 12 pm on Wednesday, May 13, 2015. As an official AMGEN Tour of California sponsor, we’ll be supporting cyclists and visitors, giving out cow bells, and raffling off a trip to Kona, Hawaii! Stop by our booth at the Stage 4 Start in Pismo Beach, where you can enter to win a 5-night stay at the Courtyard Marriott King Kamehameha’s Kona Beach Hotel – the long-standing host hotel for the IRONMAN® World Championship – where world-class triathletes begin their 140.6-mile journey with a swim right outside the hotel. And with 4 hotels in Pismo Beach, it couldn’t be a better place for Pacifica Hotels to join the festivities. Come visit us at AMGEN’s Stage 4 in Pismo Beach – located at 100 Pomeroy Ave, Pismo Beach, CA 93449. We look forward to seeing you there! Whether you’ve been cycling for years or you’re new to the sport, Pacifica Hotels offers some of the most restful and affordable hotels along the California Coast – perfect for scenic bike trips. Pass through California’s golden wine country and then ride beside the Pacific Ocean for miles and miles of coastal beauty. 25 hotels across 500 miles of pristine California coastline. Restful guest rooms with free Wi-Fi & complimentary breakfast. Scenic bike paths – including Pacific Coast Highway – named one of the most scenic roads in the United States. Ready to ride? Visit Pacifica Hotels to start planning your bike trip today! This entry was posted in Events, Hawaii, Pismo Beach. Bookmark the permalink.